The Olympus M. Zuiko Digital ED 60mm f2.8 Macro is a prime macro lens that sports a dust- and splash-proof housing, making it well suited for close-up outdoor nature photography, and its MSC (movie and still compatible) autofocus mechanism enables fast and quiet AF, making it great for shooting video as well. Designed for mirrorless Micro Four Thirds cameras, it is equivalent to a 120mm lens for a full-frame 35mm camera. With an estimated street price of $499.99, the Olympus M. Zuiko Digital ED 60mm f2.8 Macro can focus on subjects as close as 19 cm (7.4 inches) and offers true 1:1 magnification. To improve focusing speed, it offers three modes that limit the focusing range: close-up (from 19 to 40 cm), normal (from 19 cm to infinity), and far view (from 40 cm to infinity). To achieve clear and sharp images and minimize chromatic aberrations, the Olympus M. Zuiko Digital ED 60mm f2.8 Macro incorporates 13 lens elements in 10 groups and uses special glass materials such as ED (Extra-low Dispersion), HR (High Refractive index) and E-HR (Extra-High Refractive index) elements. In comparison with other Micro Four Thirds prime lenses (mounted on a Panasonic Lumix DMC-GH2), the Olympus M. Zuiko Digital ED 60mm f2.8 Macro scored quite well with a DxOMark score of 17—though, as expected, high-end lenses with shorter focal lengths and wider apertures were able to score slightly better. Given that sharpness is a critical quality for macro shooting, the M.Zuiko Digital ED 60mm f2.8 Macro’s Sharpness score of 9P-Mpix was particularly welcome, making the Olympus lens one of the sharpest Micro Four Thirds prime lenses that we’ve tested. 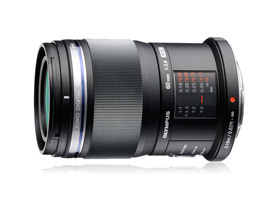 The 60mm macro lens exhibited very little vignetting, with a Vignetting Score of -0.7EV, giving it the best score among Micro Four Thirds prime lenses. You can see from the field map below, that at its maximum aperture of f/2.8, it exhibits minimal lens shading across the field. Besides the Olympus M. Zuiko Digital ED 60mm f2.8 Macro, the only other dedicated macro lens made specifically for a Micro Four Thirds mount and measured on dxomark.com is the Panasonic Leica DG Macro-Elmarit 45mm F2.8 ASPH OIS, which has an average street price of around $680 (list price: $899.95). The 45mm Panasonic Leica lens is equivalent to a 90mm for a 35mm camera and unlike the Olympus macro lens offers optical image stabilization, but does not offer a weather-resistant design. We put the two macro lenses head to head (both mounted on the Panasonic GH2), to see how they compare and found that despite the price difference, the Olympus M. Zuiko was able to match or outperform the Panasonic-made Leica lens on all the DxOMark lens scores. The lenses scored equivalently on the overall DxOMark Score, with the Olympus coming in at 17 and the Panasonic at 16, with the 1-point difference being statistically irrelevant. At 9P-Mpix and 8P-Mpix on the Sharpness score for the Olympus and Panasonic lenses respectively, the measured sharpness of the two lenses is also very close and the difference not very noticeable, but looking at the field map at their maximum aperture of f/2.8 (below), you can discern that resolution of the Olympus lens is slightly sharper in the center of the frame. Resolution performance at f/2.8 for the Olympus M. Zuiko Digital ED 60mm f2.8 Macro and Panasonic Leica DG Macro-Elmarit 45mm F2.8 ASPH OIS (from left to right). Light transmission performance was the same for both lenses, with the Panasonic Leica lens also measuring 0.4EV lower than the manufacturer’s f/2.8 claim with a 3.2TStop score like the Olympus. The Distortion scores were similar as well with both lenses scoring below the 0.2% threshold, indicating that there was no noticeable distortion measured in either lens. Both lenses displayed slight chromatic aberration with scores of 8µm and 10µm respectively for the Olympus and Panasonic lenses. When it comes to vignetting, however, the two lenses exhibit more of a difference, with the 60mm Olympus lens performing better with a score of -0.7EV compared to a score of -1.3EV for the more expensive 45mm Panasonic lens. Taking a look at the field maps at maximum aperture below, you can see that the lens shading between the two lenses is very different, with the Olympus lens besting the Panasonic by 2/3 of a stop in the corners. Vignetting performance at f/2.8 for the Olympus M. Zuiko Digital ED 60mm f2.8 Macro and Panasonic Leica DG Macro-Elmarit 45mm F2.8 ASPH OIS (from left to right). With strong performance across most of the DxOMark tests and a video-friendly MSC AF motor as well as a weather-resistant design, the Olympus M. Zuiko Digital ED 60mm f2.8 Macro is a good choice for outdoor macro shooting, such as nature portraits or close-up videos. Compared to its main (and more expensive) competitor, the Panasonic Leica DG Macro-Elmarit 45mm F2.8 ASPH OIS, it offers better quality for the money, delivering category-leading vignetting performance among Micro Four Thirds prime lenses as well as excellent sharpness.